In the early 1900s, the Aral Sea was the fourth largest inland lake in the world, providing a wealth of important ecosystem services to communities, including fishing stocks and preservation of surrounding water and soil quality. The Aral Sea's salinity and volume levels were held stable by inflows of freshwater from the Syr Darya river on the east and the Amu Darya river to the south. In 1918, policymakers from the former Soviet Union decided to divert fresh water from the Syr Darya and the Amu Darya for irrigation. This was an essential part of their plans to increase cotton production, which they referred to as "white gold," a major Soviet export. The Soviet decision makers knew that increased withdrawals from the rivers would shrink the Aral Sea to a residual brine lake. However, they believed that when the benefits of increased agricultural output were weighed against the ecosystem service benefits of the sea, the Aral's desiccation was worthwhile. The Soviet plan to maximize one ecosystem service---fresh water---at the cost of many others proceeded, and the 1930s saw the construction of a system of irrigation canals. Crop production rose as irrigated areas in Uzbekistan and Turkmenistan jumped from 6.4 million acres to 15.9 million acres over two decades, employing millions of people in the region. But with its major inflows being diverted for irrigation, the Aral Sea began shrinking in the 1960s. By 2005, it had lost more than half of its surface area, exposing nearly 30,000 km2 of lake bed, and nearly three-quarters of its volume. The formerly thriving fishing industry collapsed as the freshwater influx declined and salinity increased, leading to the disappearance of 60,000 jobs linked to the Aral Sea fishery. The dried up sea bed produced dust storms laden with chemicals and pesticides from the intensive agriculture occurring along the two rivers. This in turn led to increased air and water pollution levels, and crop damage as much as 1,000 km away. Cancers, respiratory diseases, anemia, miscarriages, and kidney and liver diseases soared in the region. Thousands of people were forced to abandon their homes as their livelihoods dried up and their health was threatened. By 1987, the Aral Sea had split into two segments---the North Aral Sea in Kazakhstan, and the South Aral Sea, more or less in Uzbekistan. In 1995, the World Bank and Kazak government built a dam to prevent water in the northern section from flowing into the southern portion. Improvements were made to irrigation along the Syr Darya River, preserving more of the main water flow into the North Aral Sea. The plan has met with success; from 2005 to 2007, the surface area of the sea’s northern section expanded by over 800 square kilometers. As fish stocks have been reintroduced, the local economy is growing. The villages near the North Aral Sea now benefit from more of the ecosystem’s services; locals experience fewer sandstorms and more rain, which has improved the drinking water, air quality, and residents health. Unfortunately, the much larger South Aral Sea is still shrinking. Uzbek leaders are unwilling to relinquish the primary water source for their cotton irrigation. 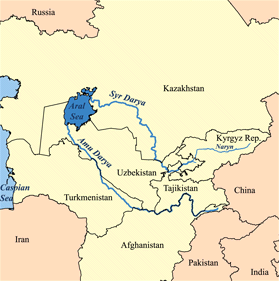 Uzbekistan remains one of the world’s major cotton exporters, and thus the Amu Darya is still being diverted to irrigate the crops that sustain the lives of millions of people. The Sudoche wetlands just south of the Aral have been successfully restored, leading to improved well-being for the local populations.1 Uzbekistan has recently announced plans to explore the dried-up Aral Sea bed for oil. It remains to be seen whether these developments will benefit the region as a whole.